I would like to share some information for local people (Indonesian) and the most for expatriate. This is to inform you all about Jakarta International Culinary Scene. 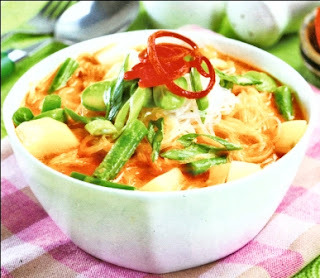 If not too long ago, recipes of the large variety of mouth-watering Indonesian dishes that are fused with mysterious herbs were carefully kept secret by housewives and royalty, today this no more. Indonesian cuisine has gone global. As a matter of fact, in 2011 CNN-Go readers choose Indonesia's Beef Rendang and Nasi Goreng as the two top dishes among the World's 50 Most Popular Dishes. In this point, I want to write about Betawi Cuisine. Betawi is the other name for Jakarta. Just as the Betawi culture is a cosmopolitan fusion of the different cultures from Java and overseas settlers, so too is its Food. 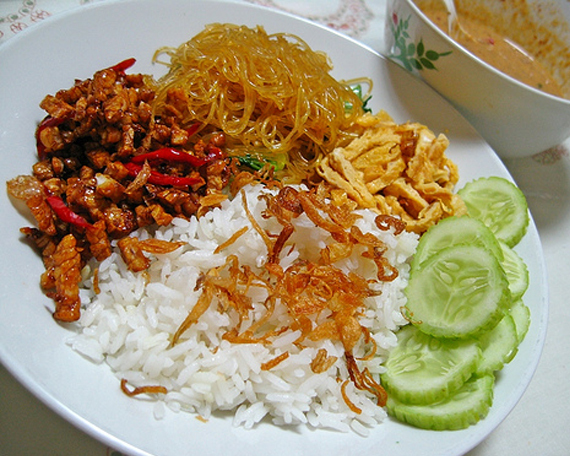 Betawi cuisine has incorporated dishes and cooking techniques from the surrounding Sunda lands, the Javanese further afield, as also the Chinese, Indian and Arab merchants who settled here as well as the Portuguese and Dutch colonial masters. Some popular Betawi dishes include: gado-gado fresh vegetables covered in peanut sauce, kerak telor-a thick and spicy egg crape, bir pletok-an aromatic and warming drink, the sticky dodol sweet rolls, symbol of togetherness and more. these can be easily found in many restaurants and especially in the Betawi neighbor hoods around Setu Babakan and Condet. Betawi cuisine normally uses plenty of lemongrass, pandanus leaves and shallots. Characteristics to Betawi cuisine is that it favors stir frying most ingredients first before mixing these with sauces, which is unlike Padang food, for example. and when cooking offal, the Betawi insist on cleaning this thoroughly first, then boiling these in a mixture of herbs with ginger before mixing them with other side dishes. Aside from the above dishes, a number of dishes influenced by the Chinese are bakso or meatballs, bakmi-meaning noodles, or soun-glass noodles, while Indian inspired popular food include martabak egg crepes, while Arabian inspired is nasi kebuli. This is Indonesia's traditional chicken or beef soup, the taste of which varies from province to province. If elsewhere, Soto is clear soup filled with chicken slices, Soto Betawi's base is beef broth cooked with coconut milk and vegetable oil. 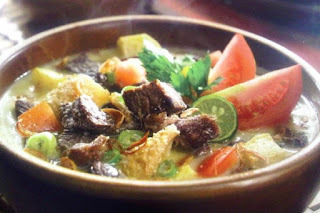 Soto is then served with slices of beef, lung, and offal that have been boiled with sauted ingredients of lengkuas, lemongrass, salam and salt. Soto Betawi is usually served with emping melinjo crackers and sambal with a slice of lemon to complete this dish. 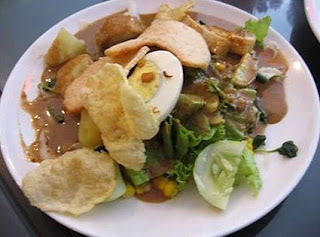 This is Indonesia's Salad, consisting of boiled long beans, beansprouts, fresh cucumber slices, fried tofu and soy bean cake, sliced boiled potatoes and other preferred vegetables. The boiled vegetables are mix together, added with slices of boiled eggs. It is then smothered in peanut sauce that is mixed with chili, shrimp paste, lemon and red sugar and strewn over with deep fried shallots. 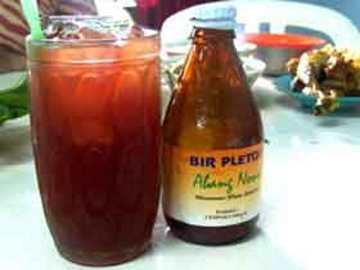 Although called beer, this drink is completely non-alcoholic and very specific to Betawi. It is actually a warming ginger drink mixed with sugar, sari bunga selasih and different roots. Ingredients comprise ginger, kayu secang, rasped lemon skin, pandan leaves, lemongrass, pepper, nutmeg, cinnamon, and water. Preparing this drink is very simple. Clean all the ingredients, boil in water until aromatic, then serve. This is a popular snack that can be found at every festivity in Jakarta. This dish consists of sticky rice and mixed with ingredients of kencur, ginger, salt and pepper that are ground together, sauted and added with rasped coconut meat. 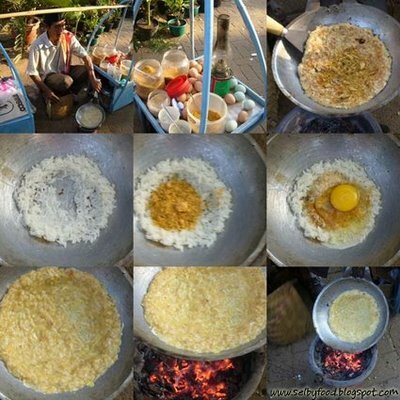 The frying pan is given some oil and the rice is spread over it then covered until cooked. 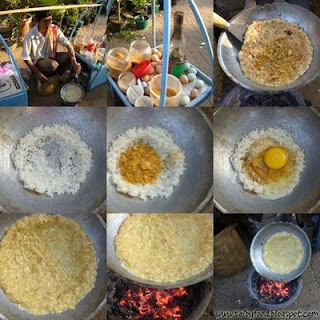 Eggs are whisked and poured over the now crispy rice and added with the coconut and other ingredients. To make this more attractive, it is strewn with fried shallots. the pan is closed again until all is ready to be served. 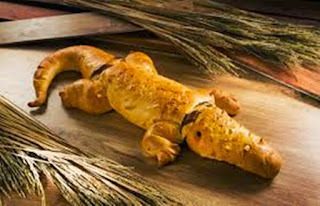 This bread made in the shape of an alligator is a must at any Betawi festivity and must most certainly not be absent from marriage proposal ceremonies. Roti Buaya or the Alligator Bread symbolizes eternal loyalty to its partner. It is also a symbol of patience, since alligators are known to be bide their time when espying their prey. This bread is baked in the usual manner, made in the shape of an alligator, then filled with chocolate chips or cheese. Originating on Java, Nasi Tumpeng is usually served at special occasions, at "Selamatan" or thanksgiving gatherings on anniversaries, wedding, births, circumcisions or other special events. the top of the rice cone is cut by the host and given to the guest of honor. The Tumpeng is to be enjoyed by all. By partaking of the Tumpeng guests are believed to be blessed or give blessing to the occasion. Today, at special dinners or in fine dining restaurants individual Tumpengs are also served. 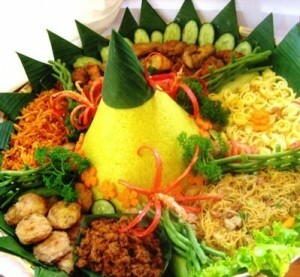 The center piece of Tumpeng is a large cone of yellow rice surrounded by side dishes, served on a rice winnowing tray decorated with banana leaves. The yellow rice is plain white rice steamed in coconut milk mixed with turmeric to get the yellow color. Traditionally, Tumpeng side dishes consist of fried chickden, telur pindang (marbleized boiled eggs), shredded omelettes, sweet dry fried tempe (soya bean cake), mashed potato fritters, sambal goreng ati (liver in chili sauce), teri kacang (fried small fish with peanuts), urap (vegetables in rasped coconuts) and more. Nasi uduk is a special Betawi culinary dish. Different from the daily steamed rice, nasi uduk is a little off white and its grains do not stick to each other, this is caused by the process of cooking. Half cooked rice is mixed with coconut milk, salam (a kind of laurel for cooking), lime leaf, galingale and lemongrass then steamed till fully cooked. Its result is delicious, aromatic rice. This dish is indeed served particularly to welcome the bridegroom's family by the bride's relatives, which takes place before the wedding at time when the groom comes to ask the girl in marriage or during the actual wedding celebrations. 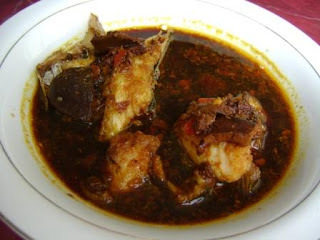 The gabus fish is cooked in the black "keluak" sauce which is derived from the fruits of the kepayang tree. The Betawi call keluak, pucung. Besides keluak, other ingredients include coriander, galangal, turmeric, vinegar, coconut sugar, fried shrimp paste and more. The result an extremely tasty dish. *Sources : Jakarta Culinary Booklet.